If your membership has not been renewed before the end of the year, you will receive a message upon log in showing the expiration date. Please let us know if you have already paid and the date is in error. Please Do NOT Share Your Login Name or Password! Click on the Members item in the menu on the left sidebar. The login page displays, with the Login Name and Password fields appearing. Enter your Login Name. If you don't remember your login, click the "?" and follow insturctions. Enter your Password. If you don't remember your password, click the "?" and follow instructions to reset your password. If your login is successful, you will see an Important Notice, and the Members menu item in the left side bar will expand to display additional choices. The "Members Only" features of the FSGS website are now available to you. 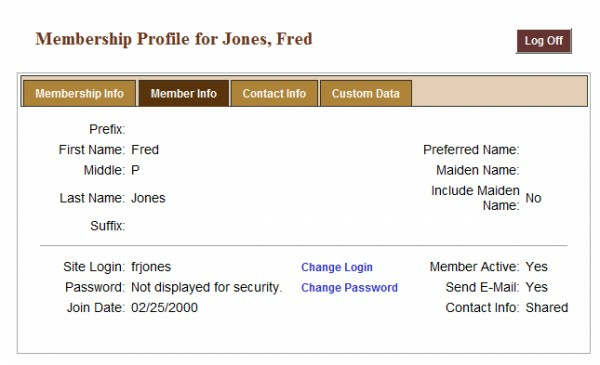 Select Profile under the Members link in the menu in the left sidebar. It is one of the menu choices that appeared when you logged in. Your Profile will display. Click the Member Info label at the top of your profile. The Member Info page will display. Click Change Login to change your login name and/or click Change Password to change your password. When you have made your desired changes, a Save button will display. Click Save to save your changes. Your new login and/or password are ready for use. If your membership has not been renewed before the end of the year, you will receive a message upon log in showing the expiration date.